Showing results for tags 'RN'. Much like the title says, what is the RN cruiser's AP shells' fire chance? I mean, there were games where I was shot at/shooting at enemies and suddenly they get on fire. And just for the record, the shells fired were from the main guns and the firing distance was above the secondary batteries' range i.e. 8-14 kms or what I think is the ship's sweet spot so it could not be due to the secondaries kicking in. Thanks. I'm by no means complaining, I'm happy to see new ships and I'll definitely give the french line a try, but I would genuinely like to know why a French cruiser line has been introduced before a Royal Navy DD, BB or even CV line, considering that at the era this game is set the Royal Navy was the most powerful in the world and the standard that all others ascribed too. I'm just curious as to how the decision making precess works. So, just for fun, I knocked up this quick list of what a potential Royal Navy Destroyer line might look like in WOWs. Seen a few comments about how they were pretty weak so it seemed like an interesting challenge to try and make them work in game. It is true that RN destroyers were much more focused on anti-submarine, rather than surface or anti-air warfare, and they did have a whole string of designs mid-late war that were very much about getting as many usable escorts out to sea as quickly as possible that don't translate well in game and would be very under-powered at higher tiers, but even after you take them out I think you can still do a full 2-10 line almost without any paper ships at all (a little stat fudging is required). I'm imagining these as pretty much a standard line, without any attempts to introduce new game-play or national flavour, but even so they come out quite unique, especially with single launch torpedoes. Soft stats esp. the torpedo type, shell type, aa, and HP can obviously be adjusted for balance. Here are the suggestions - Tier 2 - HMS Laforey (1913 L Class) Pretty standard for a tier 2 DD with 3*1 102mm guns and 2*2 533mm torpedo tubes. Her weakness is the low top speed of 29 knots. Tier 3 - HMS Radstock (1916 R Class) Basically the same as Tier 2, but rectifies the weakness with a top speed of 36 knots. Potential premiums in HMS Skate (RN - served in and survived both world wars), and HMS Radiant (Pan Asia, transferred to the Royal Siamese Navy as Phra Ruang and apparently still floating today). Tier 4 - HMS Voyager (1916 W Class) The peak of British WW1 Destroyer design, 4*1 superfiring 102mm guns, 2*3 530mm torpedo tubes and 34 knots top speed - solid all round ships for the tier. Tier 5 - HMS Ambuscade (1924 post war prototype) Yarrow designed DD with 4*1 120mm guns and 2*3 530mm torpedo tubes capable of 37 knots. Tier 6 - HMS Shakespear (1916 Thornycroft type destroyer leader) Stepping out of chronological order but the ship displacement and capabilities fit well here. Same torpedoes tubes as the previous tier but 1 extra gun. Also capable of 36-38 knots. Would be quite weak AA wise, but a semi-fictional WW2 upgrade could address that. Tier 7 - HMS Afridi (1936 Tribal Class) Having the 4*2 120mm guns would probably not balance well in game so would suggest the WW2 armament of 3*2 120mm guns (with a secondary battery of 1*2 100mm dual purpose guns), and 1*4 533mm torpedo tubes. 36 knot speed, very strong gunboat for the tier but weaknesses would probably be the relatively poor concealment and torpedo armament. HMCS Haidi the obvious premium here. Tier 8 - HMS Jervis (1938 J Class) Also has the 3*2 120mm guns of the Tribal but with 2*5 533mm torpedo tubes and improved aa, all on a smaller (and therefore stealthier) hull than the Tribal. Wouldn't be quite as good a gunboat as the T7 but an all round better DD. Tier 9 - HMS Lance (1939 L Class) Not actually the lead ship of this class but the first ship of the class shares the same name as T2. Additionally, HMS Lance seems to be the first ship in this class with my suggested main armament of 4*2 102mm dual purpose guns (Same ones used on the Black Swan and Edinburgh), once number of barrels and rof are taken into account this is still an upgrade over the T8 firepower. The ship also features 36 knots speed and 2*4 530mm torpedo tubes. Tier 10 - HMS Ypres (1943 extended Battle Class) This is where things get very paper-shippy. RN does not seem to have a good T10 candidate because the normal Battle class would be undergunned in game, while the post war Daring class has a critical weakness of 30 knots maximum speed. However, it seems that there was an extended battle class ship design planned that would feature an extra double turret. This extended class was never constructed and IRL HMS Ypres was converted into the Daring class HMS Delight (commissioned 1953) but for the purposes of game balance I would mix together the Battle and Daring classes to create an extended Battle Class that would fit at T10. That means 3*2 113mm DP guns (these were better at both AA and surface warfare than either the 102mm or 120mm guns, capable of 16 rounds per minute) in powered turrets and 2*5 533mm torpedo tubes with a top speed of 37 knots. HMAS Vampire as an actual Daring class suggested for a Commonwealth T8 premium - the excellent firepower offset by a painfully slow top speed of 30 knots. Recommended commander build for RN cruisers? Belfast is a beautiful and appealing museum warship for collectors to keep. It would be my great pleasure enjoying her in-game. 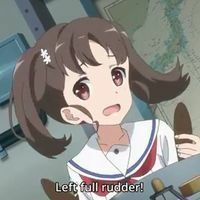 Multi-propose Light cruisers(CL) are the solution for high tier DD-heavy meta and it is welcome to introduce her as a milestone of ship type balance, just before the release of RN CL line. As a SEA server player, I hope SEA team can get her on premium store before or at the same time other servers does, just like the way Leningrad did. Thank you for making such legendary ship in this game!